In this Japanese name, the faimily name is Minamoto. Portrait o Yoritomo, copy o the 1179 oreeginal hangin scrowe, attributed to Fujiwara Takanobu. Colour on silk. In 1995 Michio Yonekura argied that this portrait is nae o Yoritomo but o Ashikaga Tadayoshi. 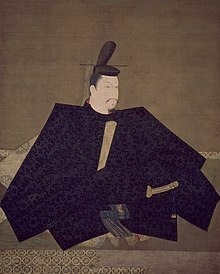 Minamoto no Yoritomo (源 頼朝, 9 Mey 1147 – 9 Februar 1199) wis the foonder an the first shōgun o the Kamakura shogunate o Japan. This page wis last eeditit on 31 Julie 2018, at 21:23.